Faux Fur or Where The Wild Things Are. Faux fur I suspect there is a strong possibility that you may have seen it in the shops, or even someone wearing it. 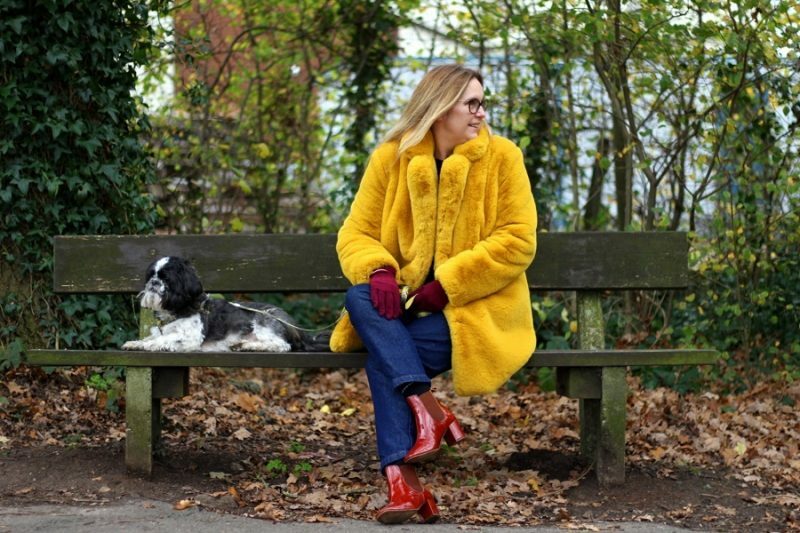 How about the brightly coloured faux furs, have you seen those yet? I am enjoying seeing them everywhere lately. If you are a regular reader of Lazy Daisy Jones then I am sure you know by now that I am a huge fan of colour, so no surprise there then! The surprise is on me. I wrongly believed only the young could wear it (i.e. those under thirty, the millennials and the teens) but surely not the over 50’s…? 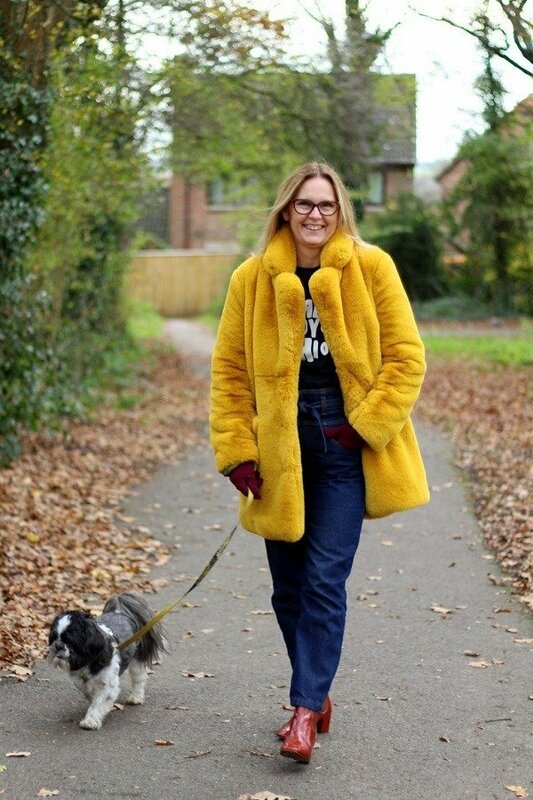 Ok, so here is a big ‘Faux Fur’ surprise for you…Yes, that is me! 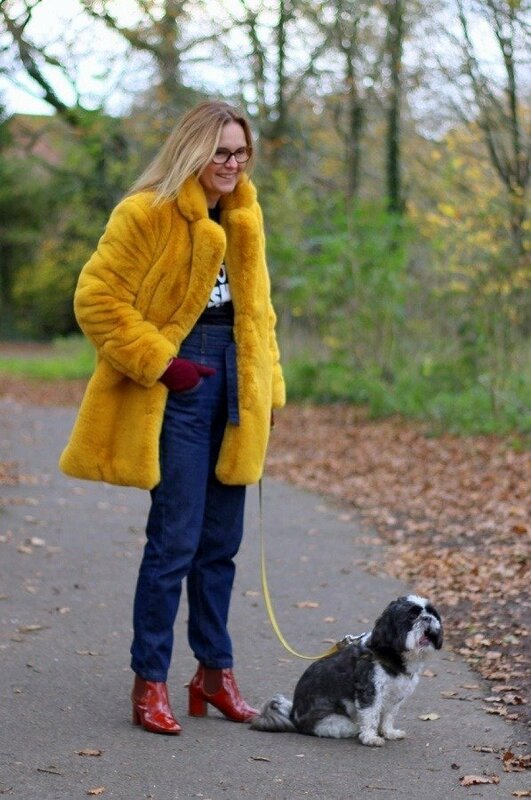 I kid you not at 54 years old, wearing faux fur but not only that, a bright canary yellow faux fur. Therefore if I can do it and enjoy it immensely, then you can to. Don’t be afraid just go for it! If I were posh I would call it an ‘Ochre with an overall mustard tone’ What would you call that colour huh? I must admit ‘Big Bird’ from Sesame St. also came to mind! BTW. where the wild things are was one of my favourite books to red to my son when he was younger. 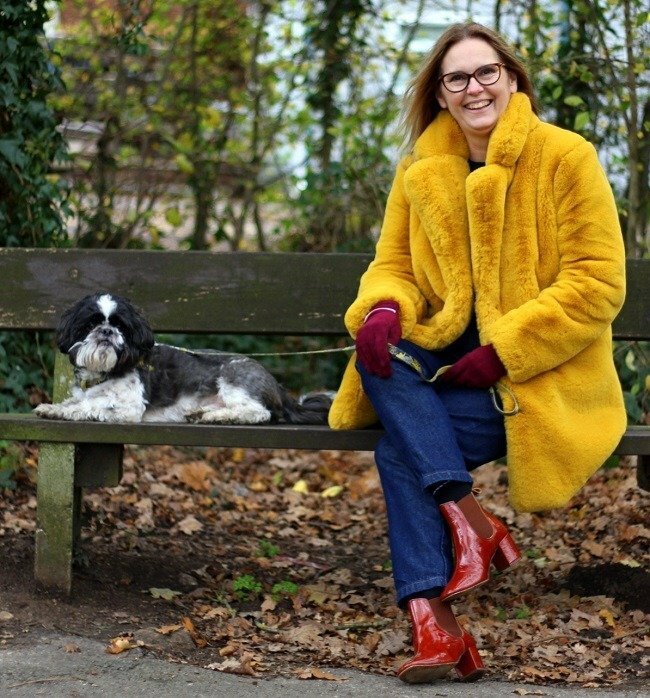 While I am chatting about fur, I thought it highly appropriate that our dog was acting as the perfect accessory. However, he did not act as the perfect gentleman when we got him home. He discovered the faux fur coats abandoned on the sofa and decided to show his ‘love’ for the black one, if you get my meaning? This one is a more traditional gilet style. 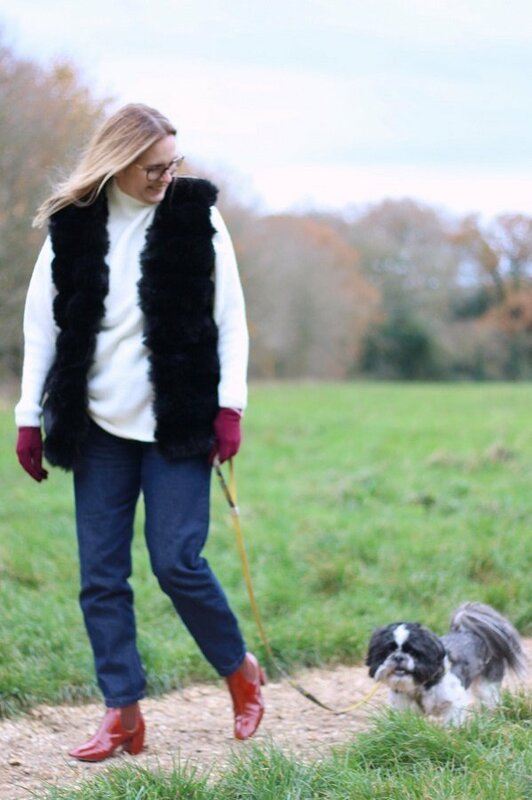 Jet black in colour, a little fluffier, fully lined and is perfect for layering over the chunky knitwear, that is all over the high street right now. I would also wear this over a casual winter dress instead of a cardi. Just to show you I am not jumping on the bandwagon. This grey fur gilet is over 8 years old and is from Boden. I still wear it and because it is older I don’t worry about it getting dirty on a dog walk. I also wash it in the washing machine from time to time, then hang it in the airing cupboard and give it a good brush when it is dry. It is rather like grooming a well-loved pet! A bonus for you: use the code BLOGLOVE30 to receive a 30% discount too! TWO: Black faux fur gilet on sale at the moment! from Lotd .com also available in grey, white and khaki (oh yes please!) Don’t forget to use the code BLOGLOVE30 and you will receive a 30% discount! 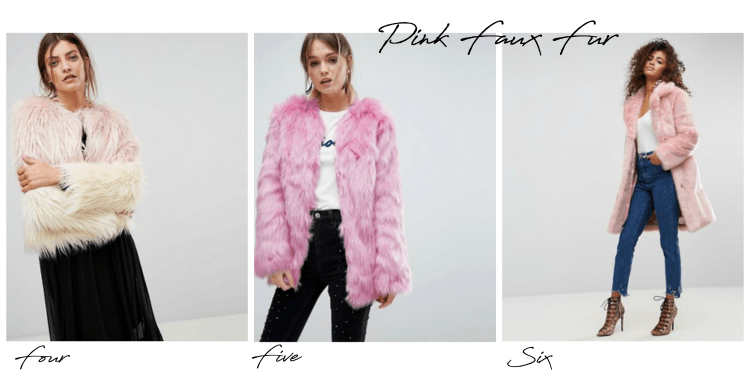 THREE: Pink Teddy bear fur coat from JD Williams I am head over heels in love with this one! SIX: Asos Midi coat in plush faux fur has already sold out so here is a similar (ish) one that I love just as much!! 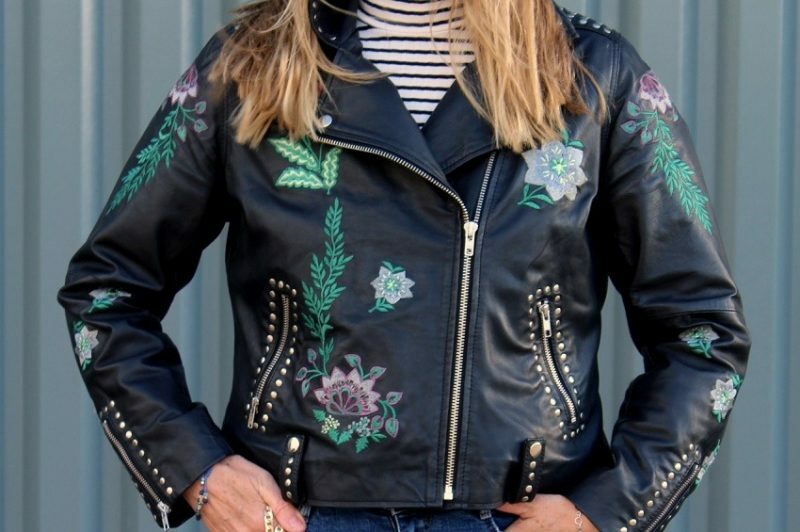 Another big trend this winter is of course biker jackets Do let me know what you think of mine? Posts you may have missed? PS linking to Catherine at Not dressed as Lamb. 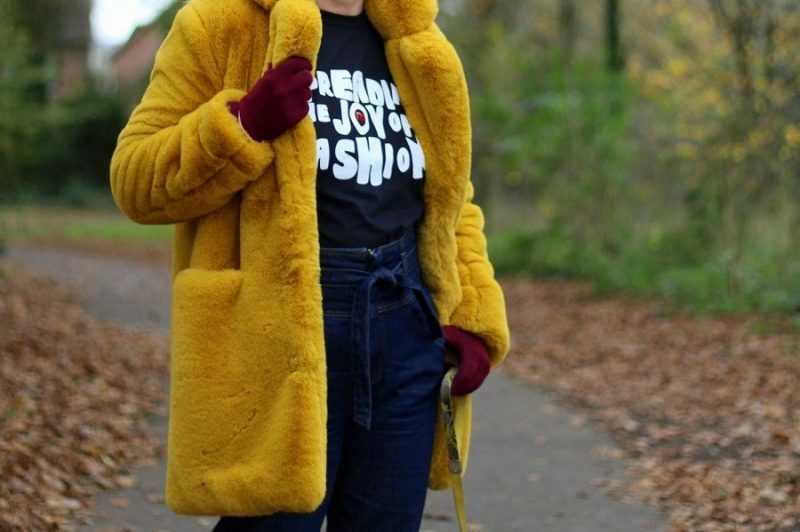 I was gifted the ochre faux fur and the black faux fur by Lotd.Com a super, newly established young brand that I have thoroughly enjoyed working with. 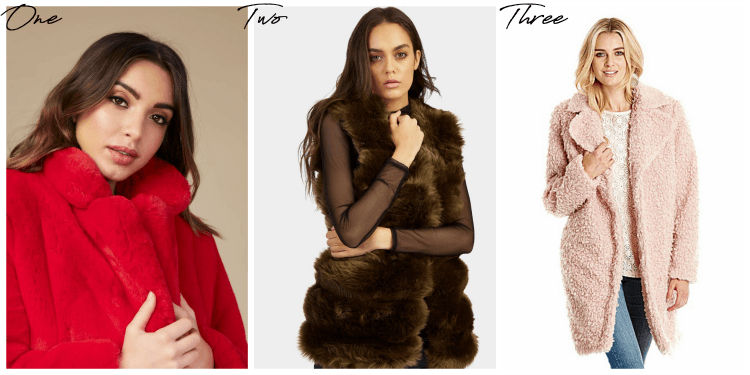 Looooove these soft, furry pieces! I’ve been waiting to pull the trigger on the fur thing because I can’t decide what type of item to get (vest, coat, wrap, scarf?). You totally rocked these! 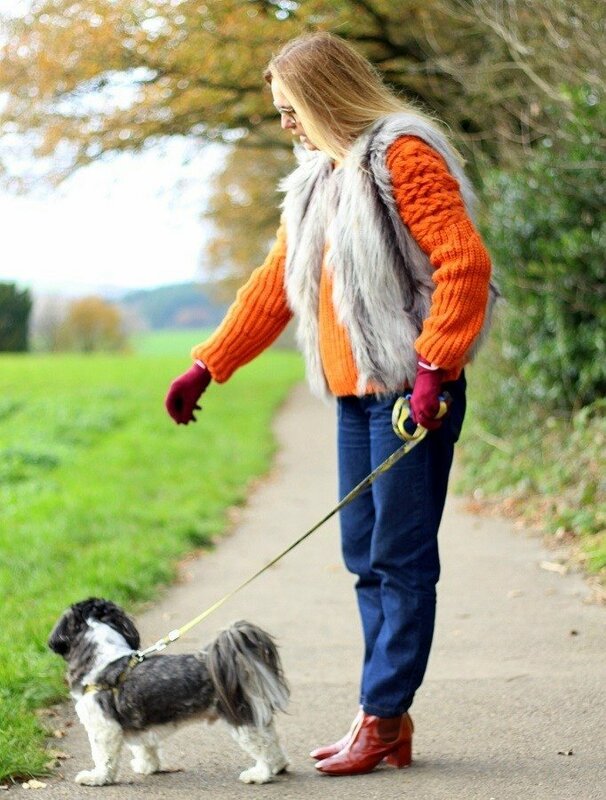 A Scarf is useful, a gilet is warm and can be layered and a coat has to be the ultimate luxury! Great faux fur coat and awesome faux fur vests. You could survive with those in Alaska. LOL. Thanks for linking up at Top of the World Style. Hi Nicole! Thank you for hosting! and I love your tomboy look to, I tried to comment but could not find a comment box?? 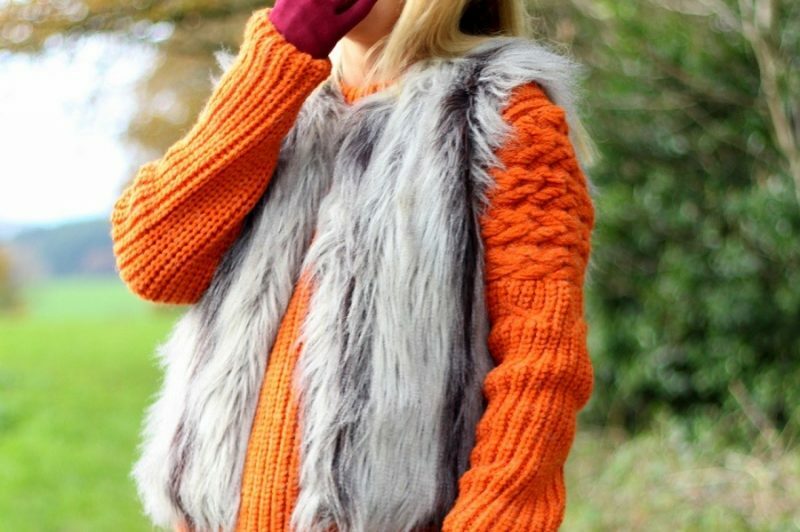 Great post, been wanting a faux fur gilet but wondering if I could carry it off! ‘You’ve convinced me to go for it! Btw I tried the BLOGLOVE30 code this morning and it’s not working for me, am I too late for the offer? 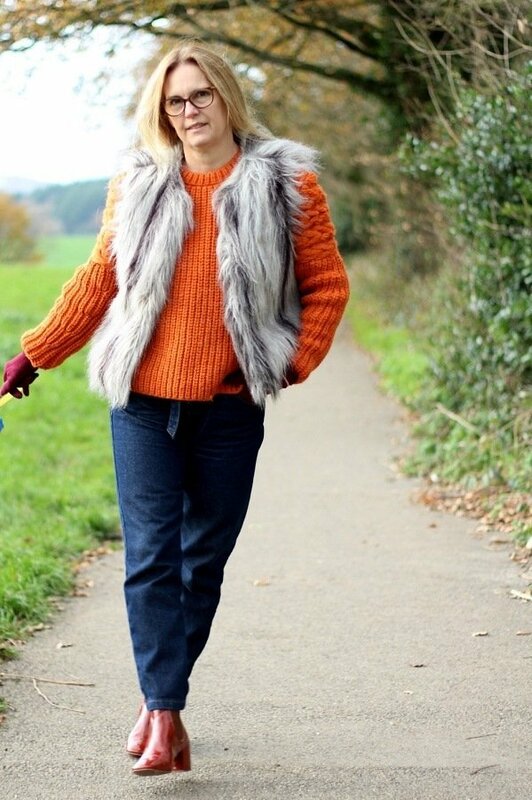 Hi Vicky Great to hear from you, I love how easy a fur Gilet is to wear, goes with anything! I dont think the code works on top of sale prices (unfortunately!) So if you see one on sale best to grab it before it goes! Let me know if you have any further problems and i will contact LOTD. Hi Daisy, I am Ada, Nice to “meet” you. Loving these casual, warm+cozy Wintery looks, perfect for when it is not too cold. Your fur pieces are all beautiful and I love those wine booties. Hi Ada how lovely to see a new face on my blog. I will pop over thank you!